Every rational number can be expressed as a decimal number. For example 1/2 = 0.5, 1/4= 0.25, 1/8 = 0.125, 1/5 = 0.2 and so on. These rational numbers have fixed number of digits after the decimal point. These are rational numbers whose reminder becomes zero after few successive divisions (division is exact). However, there are rational numbers like 1/3 and 1/7 where the reminder does not become zero even after several successive divisions. Moreover, we notice that 1/3 = 0.33333 .. And 1/7 = 0.142857142857142857…. 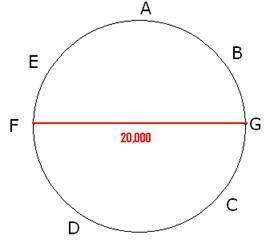 In the case of 1/4, the decimal has only 2 digits after the decimal point and they are called terminating decimals. Where as in the case of 1/3 and 1/7 there is no fixed number of digits after the decimal point and the group of digits repeat themselves. Such decimals are called non terminating and recurring decimals. Terminating decimals and recurring decimals can be expressed as rational numbers which is of the form p/q with q 0. But, non terminating and non recurring decimals cannot be expressed in the form p/q with q 0. Definition: Non terminating and non recurring decimals/numbers which cannot be written in the form p/q with q 0 are called irrational numbers. Aryabhatta the Indian mathematician of 5th century AD was the first one to give approximate value of to 4 correct decimal places (3.1416). Note: Since is an irrational number, 4+ is also an irrational number and hence is also an irrational number. Let x = 0.4 . Note that only one digit, 7 (periodicity = 1) repeats, so we multiply both sides by 10. Thus, a number whose decimal expansion is terminating or non-terminating and recurring is rational.